Dear aspirants, please find the UPSC Civil Services Exam (Mains) 2016 Essay Question Paper below. You can download the same as a PDF using the print-pdf button on the left/bottom. 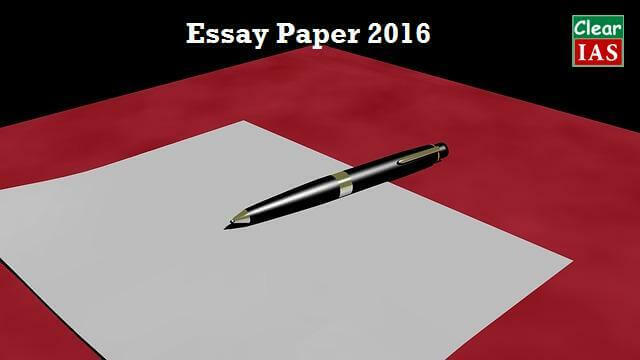 Essay questions of 2016 are comparatively easier than those asked in 2015 and 2014. Four analytical questions were asked in Section B – with all four questions having an ‘OR’ option. The two sides were asked to analyse before taking a stand. Questions like digital economy, jobless growth, water disputes, innovation etc. are all GS topics, and hence normally covered by aspirants while studying General Studies Paper 2 and General Studies Paper 3. Related questions were asked in ClearIAS 50-day HVAW, 30-day AWP, model tests and other GS tests. Though the exact meaning of the word ‘engendered’ is not completely related with ‘gender’, the question 1 in section A is connected with gender equality as it can be inferred from the ‘Hindi Translation’ which talks about ‘Stree-Purush…’. “Development, if not engendered, is endangered” is a catchy quote, taken from a UN development report published a decade and a half ago. It talks about the need for gender equality. the marks of all 7 papers + paper A & B be displayed..?? Aap Hindi me likh sakte hai. Commonly question were simple but writing was enough do if writing skills will be fast then easily able to qualify mains paper.